“Beware, dear boy – the Gibberwock! And hast thou mugt that Gibberwock? come to mine breasts dear brother boy! View the full-sized rendering of Gibberwocky [the Featured Image] in close-up detail. 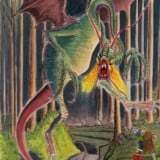 It is an Acrylic Watercolour Painting I did in 1982, and is located in the Art Section of this site on Page 2 of the Fantasy Category.